On Saturday and Sunday, meet Steve Lancia, owner of Northcamp Wilderness Survival School. Steve will do a talk on winter survival skills. He has a forestry degree from SUNY Morrisville, was a member of a search and rescue team in the Monongahela National Forest in West Virginia, a professional with the National Ski Patrol, is a licensed New York state guide, an American Red Cross instructor and a licensed emergency medical technician and wilderness technician. On Saturday and Sunday, winter working dog demonstrations will take place. We welcome the Newfoundland Club of New England from 1 to 4 p.m., Sunday. The Connecticut Valley Siberian Husky Club will bring their teams to the festival from 10 a.m. to 1 p.m., Sunday as well. On Saturday from 11 a.m. to 3 p.m., we are joined by the New England Saint Bernard Club. Also Saturday and Sunday, a live concert to keep you warm: Sharks Come Cruisin’, a band that combines an energetic mix of original and traditional sing-along songs, keeping the themes of audience participation and celebration at the center of their live performances, will play at noon and 3:30 p.m., in the Greenmanville Church. “So, if you like your shanties at the top of your lungs, with a ‘Gansett in one hand, and the other keeping time with the drums, Sharks Come Cruisin’ is the band for you.” ~ Jack Tar Magazine. On Saturday, beginning at 10:30 a.m., you can watch the artists from Ice Matters™, a Connecticut ice carving company, work their magic with a giant block of ice. Bill Covitz is the owner of Ice Matters™. Bill is a former Chef and a 1991 graduate from the Culinary Institute of America in Hyde Park, New York. He now works in a 12-degree studio creating ice masterpieces for country clubs, hotels, banquet facilities, restaurants and individuals throughout Connecticut. At the 2004 National Ice Carving Association’s Nationals he was the Grand Champion, placing first on both days of the 2-day competition. Included in the weekend is a special show in the Planetarium, Aurora Borealis: The Northern Lights. The Northern Lights are a breathtaking phenomenon – a natural wonder that illuminates the night sky with magnificent colors! In addition to the visual beauty, there is also some fun and quirky science behind this event. Join us for a special planetarium show this weekend only, to learn about what causes the Aurora Borealis, and see the shimmering curtains of light projected onto our planetarium dome. Admission $4, $3/members, and 3 and under are free. See the Museum’s exhibition Death in the Ice: The Mystery of the Franklin Expedition. Please note: Tickets purchased online for the Ice Festival are valid for all three days of the event. 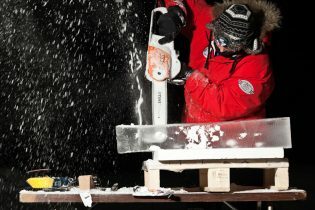 Members receive free admission to Ice Festival! Not a member? Join today!